Durham living is best experienced with a view. The Bartlett, sitting in the heart of the vibrant Brightleaf District, gives you access to the best that the city holds. 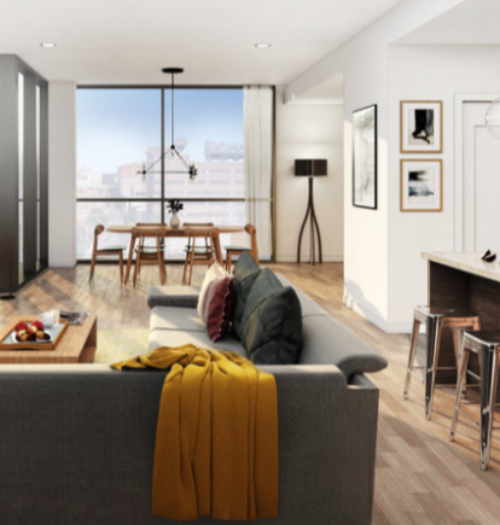 From the outside, it shows off bold lines and an expansive glass exterior, while inside The Bartlett offers 34 one-of-a-kind luxury residences with indulgent interiors and must-have amenities. Welcome to life in the Bull City. Acclaimed local architect Ellen Weinstein and proven local developers East West Partners have attended to every detail of The Bartlett—from light and sound to materials and space. Discover one-, two-, and three-bedroom homes from two distinct and stunning design options that will appeal to both traditional and contemporary tastes. See website for availability and floorplans.